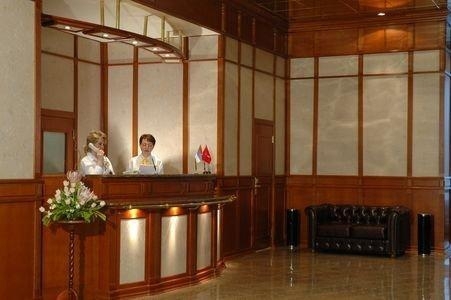 The nearest tube station to the Molodayozhny Moscow Hotel is Timiryazevskaya which is around seven minutes away on foot and central Moscow is just 12 minutes away. Mainline stations are within an hour's drive of the hotel, and for guests arriving by air Sheremetyevo Airport is roughly 25 kilometres' distant. Guest rooms vary from accommodation units sharing bathroom facilities, to ensuite rooms. All feature a writing desk, telephone and satellite TV. Business class rooms feature broadband Internet access and a mini bar. The Molodyozhny features the 'Derzhavniy' restaurant which offers traditional Russian cuisine, and the 'Amore Mio' cafe which serves Italian meals.